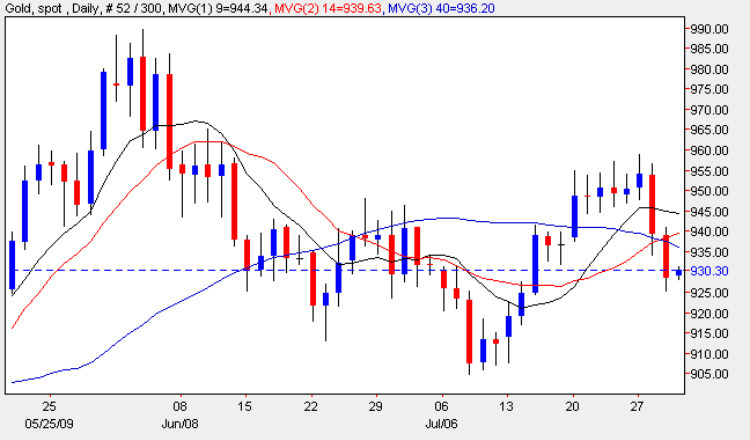 Yesterday’s wide spread down bar for spot gold prices, merely served to reinforce the bearish engulfing candle of Tuesday on the daily gold chart, and ended the trading session at $927.20 per ounce, closing well below all three moving averages. The strength and depth of this reversal will really be defined in the next few days, with the various support levels playing a pivotal role, the first of which is now on the horizon at $925. Should this minor level fail to hold then we could see a re-test of the major support area in the $905 price region, and a failure here could see gold prices move back to the $890 price point in the medium term. With all three moving averages now well above the price trend, this is adding further pressure to the current downwards move, the speed of which has been reinforced by the spread of the candles, clearly indicating that the move has momentum behind it, and it will therefore require some equally strong buying from the bulls to halt the slide. Should the $905 price level be breached then any future reversal higher will require a sustained effort to break through this solid congestion if we are to see another run at the $1000 per ounce level in the longer term. The gold bulls may have to wait for some time for this price target, with the spot gold chart now looking tired.